Synthetic peptide conjugated to KLH derived from within residues 550 to the C-terminus of Human Lamin A. Our Abpromise guarantee covers the use of ab26300 in the following tested applications. WB Use a concentration of 1 µg/ml. 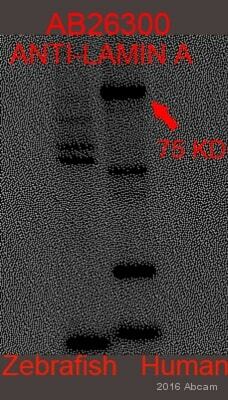 Detects a band of approximately 76 kDa (predicted molecular weight: 74 kDa). Lanes 1 - 4: Merged signal (red and green). Green - ab26300 observed at 76 kDa. Red - loading control, ab8245, observed at 37 kDa. ab26300 was shown to recognize Lamin A in wild-type HAP1 cells along with additional cross-reactive bands. No band was observed when Lamin A knockout samples were examined. 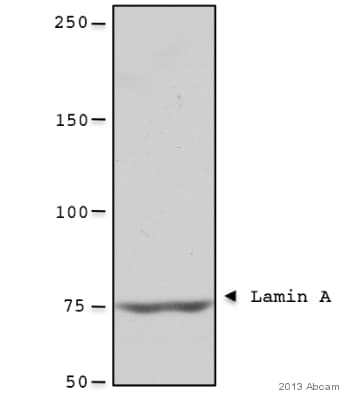 Wild-type and Lamin A knockout samples were subjected to SDS-PAGE. ab26300 1ug/ml and ab8245 (loading control to GAPDH) at a dilution of 1/1000 were incubated overnight at 4°C. Blots were developed with Goat anti-Rabbit IgG H&L (IRDye® 800CW) preadsorbed (ab216773) and Goat anti-Mouse IgG H&L (IRDye® 680RD) preadsorbed (ab216776) secondary antibodies at 1/10,000 dilution for 1 hour at room temperature before imaging. ab26300 stained in Hela cells. Cells were fixed with 100% methanol (5 min) at room temperature and incubated with PBS containing 10% goat serum, 0.3 M glycine, 1% BSA and 0.1% triton for 1h at room temperature to permeabilise the cells and block non-specific protein-protein interactions. The cells were then incubated with the antibody ab26300 at 1µg/ml and ab7291 (Mouse monoclonal [DM1A] to alpha Tubulin - Loading Control) at 1/1000 dilution overnight at +4°C. The secondary antibodies were ab150120 (pseudo-colored red) and ab150081 (colored green) used at 1 ug/ml for 1hour at room temperature. DAPI was used to stain the cell nuclei (colored blue) at a concentration of 1.43µM for 1hour at room temperature. Immunocytochemistry/ Immunofluorescence - Anti-Lamin A antibody (ab26300)Image from Khatau, Shyam B. et al. PLoS ONE 7.5 (2012): e36689. doi: 10.1371/journal.pone.0036689. Fig 5A. Immunocytochemistry/ Immunofluorescence analysis of hESCs labeling Lamin A with ab26300 at 1/500 dilution. Samples were fixed with 3.7% paraformaldehyde for 1 hour, and stained for nuclear DNA (DAPI), filamentous actin, tumor recognition antigen 1–81, and nuclear envelope protein Lamin A. For staining, cells were permeabilized with 0.1% Triton X-100 for 10 min. Goat serum, 10%, in phosphate-buffered saline was used to block nonspecific binding for 20 min. Immunocytochemistry/ Immunofluorescence - Anti-Lamin A antibody (ab26300)This image is part of an Abreview submmited by Dr Kirk McManus. ab26300 (1/2000) staining Lamin A in assynchronous HeLa Cells, by Immunocytochemistry/ Immunofluorescence. 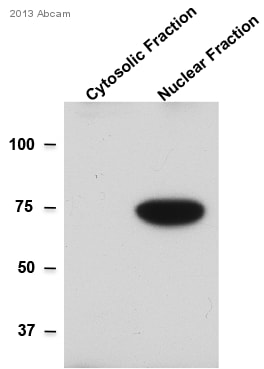 Secondary antibody: goat anti-rabbit conjugated to Cy3 ® (1/200). 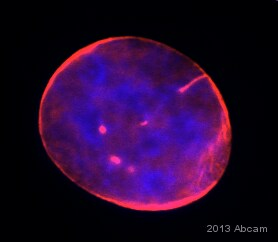 Cells counterstained with DAPI in order to highlight the nucleus. 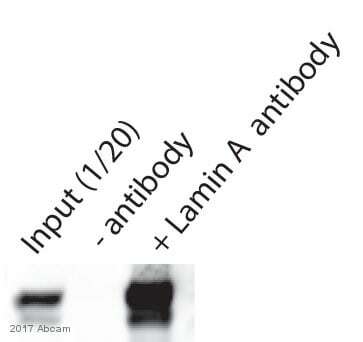 Western blot - Anti-Lamin A antibody (ab26300)This image is courtesy of an anonymous abreview. Immunocytochemistry/ Immunofluorescence - Anti-Lamin A antibody (ab26300)This image is courtesy of an anonymous abreview. Immunocytochemistry/ Immunofluorescence analysis of human vascular smooth muscle cell labeling Lamin A with ab26300 at 1/200 dilution. Cells were fixed in formaldehyde and permeabilized with np40. Cells were blocked with 3% BSA for 1 hour at 21°C. A polyclonal donkey anti-rabbit Alexa Fluor® 568 conjugated secondary antibody was used at 1/500 dilution. Observed band size: 76 kDa why is the actual band size different from the predicted? Immunocytochemistry/ Immunofluorescence - Anti-Lamin A antibody (ab26300)Image from Khatau, Shyam B. et al. PLoS ONE 7.5 (2012): e36689. doi: 10.1371/journal.pone.0036689. Fig 5E. Immunocytochemistry/ Immunofluorescence analysis of Human Lung Fibroblasts labeling Lamin A with ab26300 at 1/500 dilution. Samples were fixed with 3.7% paraformaldehyde for 1 hour, and stained for nuclear DNA (DAPI), filamentous actin, tumor recognition antigen 1–81, and nuclear envelope protein Lamin A. For staining, cells were permeabilized with 0.1% Triton X-100 for 10 min. Goat serum, 10%, in phosphate-buffered saline was used to block nonspecific binding for 20 min. ab26300 at 1/1000 staining human HeLa cells by ICC/IF. 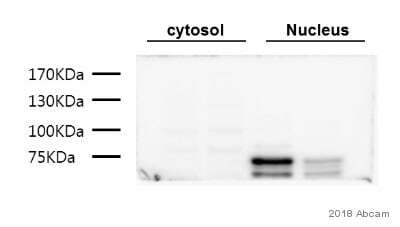 The cells were paraformaldehyde fixed, permeabilized with Triton X100 and blocked with BSA before incubation with the antibody. A Cy3 ® conjugated donkey anti-rabbit IgG was used as the secondary. Additional bands at: 100 kDa, 45 kDa, 70 kDa (possible degradation product). We are unsure as to the identity of these extra bands. Publishing research using ab26300? Please let us know so that we can cite the reference in this datasheet.